Right now, there are young men and women in the IDF who have come alone to Israel, without their families, to live the dream of building lives in Israel and serving our people in the military. The term is chiyal boded – Lone Soldier – and Israel embraces them with love and care. I was touched last week, after posting “For the IDF: Operation Pillar of Defense,” when the mother of a Lone Soldier emailed to say that it gave voice to her prayers. These young men and women are the inspiration for this prayer, but the idea came from a soldier’s mother. It’s a prayer for Lone Soldiers and all soldiers of the IDF. And to serve Your People in the IDF. The hallmarks of our military. Let comradeship bolster their courage. Of a strong and vital Jewish state. And the families of all our military. For the well-being of their children. Grant a swift and successful end to Operation Pillar of Defense. Shield our soldiers from the traumas of war. So that they may keep us safe. 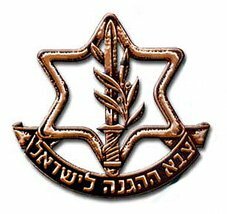 Postscript: A few lines of this prayer were taken from “For the IDF: Operation Pillar of Defense.” Here are links to two more related prayers, “To the Terrorist” and “For Peace in the Middle East,” as well as a link to more prayers for Israel.